There’s another Air Jordan 17 collaboration on the way. Thats right, after surfacing earlier this year, we finally have a detailed look at the Trophy Room x Air Jordan 17. This follows on from Marcus Jordan’s Air Jordan 16 the year before, continuing his love for Jordan retros in the mid-teens. But as the subheading suggests, this is the second Air Jordan 17 coming our way soon, both coming from collaborative efforts – both from South Florida-based sneaker stores. You can check out the SoleFLy x Air Jordan 17 Low “Lightning here. 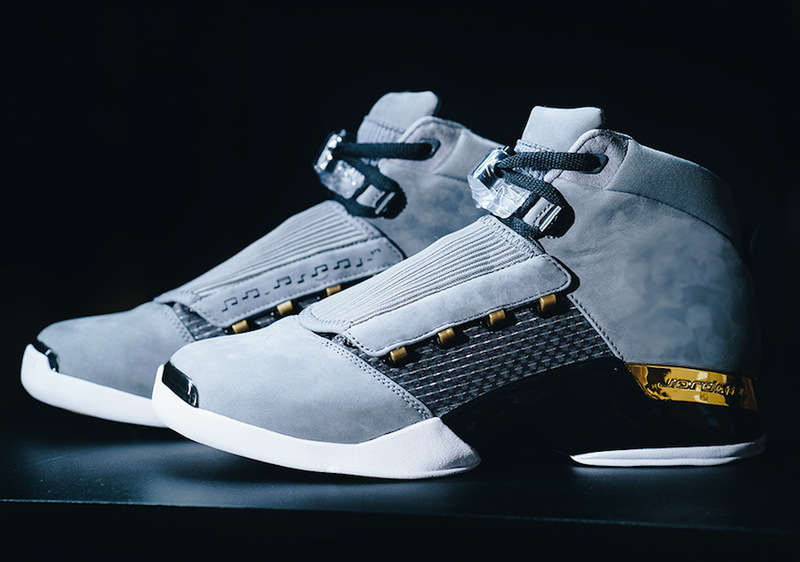 But for this Jordan 17, it comes with a lux Grey, Black and Gold color scheme – something we’ve seen before from Trophy Room exclusives. We’ve just confirmed the official release date to be this weekend – October 28th. Grab an updated look at Marcus Jordan’s latest collaboration with his dad below, courtesy of Russ Bengtson. Marcus Jordan’s latest Trophy Room x Air Jordan 17 releases tomorrow, October 28th via their website. As you could have guessed, these will be extremely limited, with less than 4,500 pairs available. The retail price tag is set at $323, which includes a custom t-shirt designed by Marcus, and free shipping. The release will also be available exclusively at TIER nightclub in downtown Orlando at 8AM. Peep Trophy Room’s dope showcase video and some extra shots below!